Page 4 – R.S.O. Curiosities! Of course, everything is capable of having errors and mistakes, and RSO handstamps are no exception. 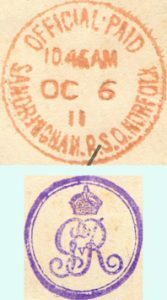 However, surprisingly few RSO handstamps are known with mistakes in them. 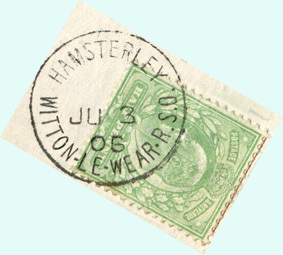 Temporary (or skeleton) handstamps are the most prone to error due to the urgency with which they had to be provided, and the irregular nature of the date setting slugs compared to the normal handstamps. As you can see, the month and day values of the date are not only upside down, but the year part of the date has also been incorrectly placed above the above the month and day. 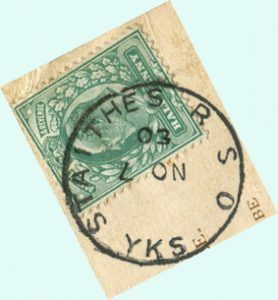 Curiously, the regular Staithes R.S.O / Yorks handstamps (a 23 mm single ring stamp) is not recorded until 24 December 1910 – long after RSOs had been abolished, and is subsequently known to have been used continuously until 21 March 1922. 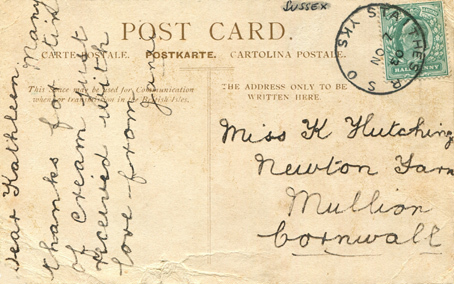 The practice using of obsolete handstamps appears to have been fairly common; offices would often not be provided with a ‘non-RSO’ handstamp until the obsolete RSO handstamps was no longer serviceable. Could sub-offices have sub-offices of their own (sort of ‘sub-sub-offices’)? Apparenty, yes! 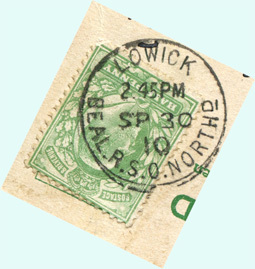 Some smaller village offices were regarded as sub-offices of Railway Sub Offices and this was reflected in the postmarks of the ‘sub-sub-offices’, which included the names of both establishments in the handstamp. 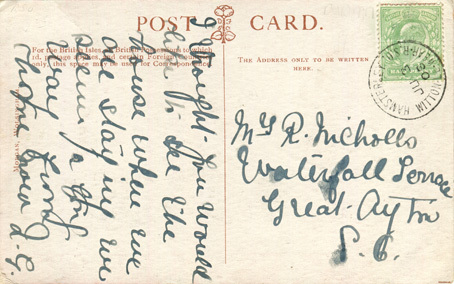 Finally, we come to what is probably the most exclusive RSO postmark of all time! 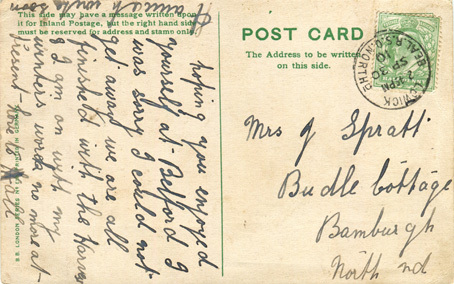 The Sandringham Post Office dealt with mail from the Royal Household when the Royal Family were in residence at Sandringham. 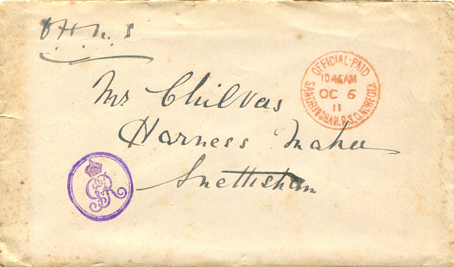 Indeed, not only can we show you the cover, we can show you the actual letter which was inside the cover! 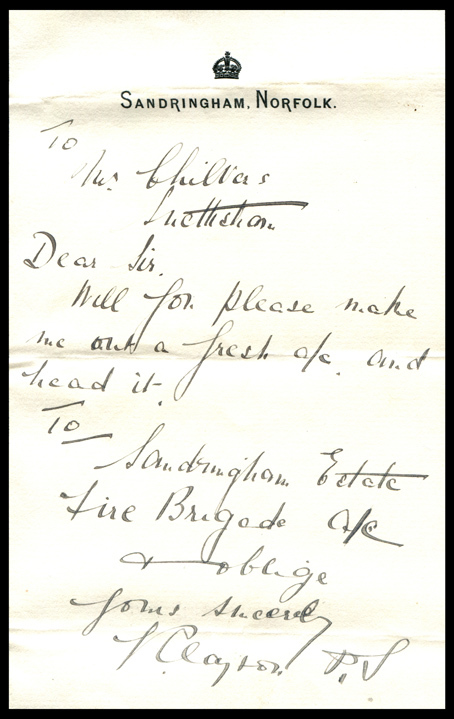 The letter asks the Harness Maker to set up a new account to deal with business from Sandringham Estate Fire Brigade.